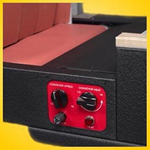 Model 1512, shown with optional stand with casters ($535.00) & takeaway conveyor ($335.00). 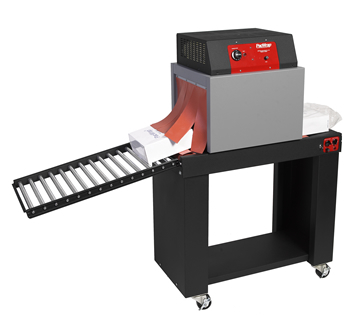 Variable speed conveyor with infinitely adjustable thermostat for belt heat controls is standard on all our heat shrink tunnels. With your choice of tunnel chamber heights, these PacWrap® heat shrink tunnels are designed and built to provide the perfect combination of heat and airflow for virtually any standard shrink film or shrink band. Highly energy efficient, both models feature 15" wide tunnel chamber openings. Economical to own. Economical to operate. Can be run 24 hours a day. PERFECT FOR SHRINK BANDS TOO! Shipping Weight: 160 lbs. 180 lbs.